Instructions: White 12 x 12" cardstock is the background. Find the 12 x 12 patterned paper with the wavy design I used. Hand cut along those wavy edges, cutting out the middle floral design. Adhere these pieces to either side of the white cardstock. Find and cut out the 2 purple border strips. Adhere these to either side of the layout. Cut a strip of green patterned paper that is 2.75", and mat this in white cardstock. Adhere up the middle of the layout using crafty foam tape. 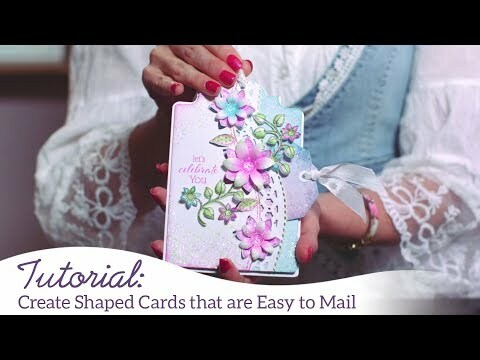 Find and cut out the decorative journal block with the pink decorative edge. Add a piece of it to the top and bottom of the green patterned strip. Die cut 2 of the decorative medallions using light green cardstock. Adhere to either side of the green patterned strip. Find and die cut out the large mauve tag, and the small green patterned tag. Using the Hand Stitched Accent die, cut out a frame for the photo from white cardstock. Mat this in another layer of white cardstock and distress the edges. Adhere the framed and matted photo to the layout using 3D foam squares. Add the layered tags above the matted photo. Add a bow of burlap string to the mini tag. Find and cut out the "A Time to Remember" sentiment and flag one end. Adhere to the layout just below the framed photo. Stamp and die cut 1 set of the small Buttons & Blooms in purple ink (Violet). Stamp and die cut 1 small and one medium set in dark pink ink (Berrylicious). Stamp and die cut 1 small and medium set in teal ink (Broken China). Stamp and die cut at least 1 set of buttons in each of the colors above. 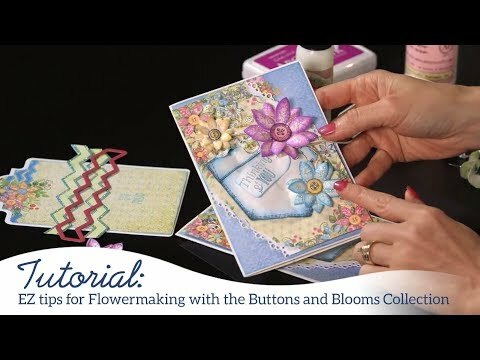 Add color to the flowers and buttons using ink and daubers. Pink (Candy), teal (Broken China), purple (Pixie Mauve). Stamp and die cut 1 of each of the Patchwork Daisy images using dark green ink (Seaweed). Add color to the leaves and stems using ink and daubers (Green Apple). Shape the flowers using the 3D Floral Basics Shaping Mold. Shape the leaves using the Deluxe Flower Shaping Kit. Assemble the flowers. Add liquid adhesive on the top of the button images, let dry. This makes the buttons look real. Add a button to the middle of each flower using a small 3D foam square. Add a Patchwork Daisy vine to either side of the framed photo. Add flowers on top of the flower images on the vines. I added a few more buttons around the layout and added a couple of real (white) buttons.